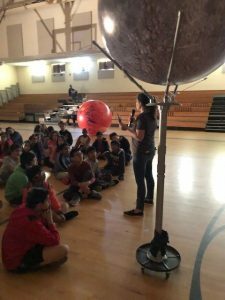 Orbit Earth Expo Visits River Trail Middle! 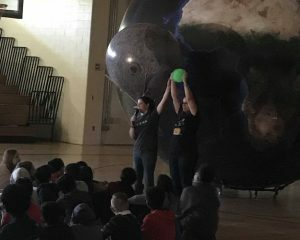 JOHNS CREEK, GEORGIA – SparkPoint Innovations had a great time bringing Orbit Earth Expo to the 6th graders at River Trail Middle School in Fulton County! We love seeing you all each year! 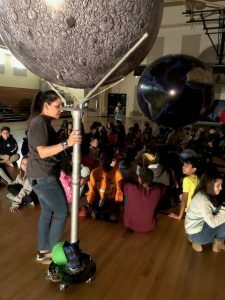 Students were on the ball, solving mysteries of the solar system as they rotated and revolved the earth and moon models with ease. Scale of the moon? Solved. Scale of the sun? No problem – but can you imagine if we were to bring the scale-sized sun that would match Orb? No way! Wouldn’t begin to fit in your city, much less your school! It’s a much better idea to bring a marble to match our sun model. 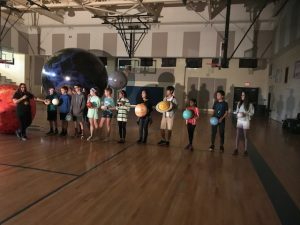 We had a blast building our own solar system and acting out the orbits of the planets. Of course, they’re never really in a straight line, are they? It’s hard to believe how long some of the orbits are – Neptune takes 165 years to travel just once around the sun! But, if you lived on Mars, you would only be about 6 years old since it takes 687 days to make a year! Wait, who let Pluto in? We had some fun questions come up today! First, how DID we get that model into the gym? 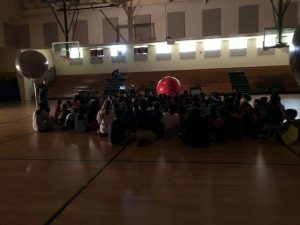 Secret: Orb is like a huge beach ball that we inflate for schools. When he’s deflated, he is about the size of a pillow! And a second question, how many earths would it take to fill up the sun? Answer? One million. Wow! Thanks for having us to your school today! 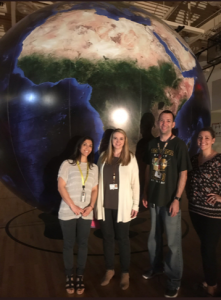 What a great team of science teachers River Trail has! We can’t wait to see you again in the future. What phase of the moon is represented here? Orb loves posing with teams of science teachers! Oh, Benny the Beach Bum. What a life! Do you remember what this demonstration taught? Can you spot George? Is the sun rising?